A lawyer's useful tips for on-boarding an employee at your startup. Have you decided to hire an employee for your startup ? Below, we share useful tips for on-boarding an employee at your startup. 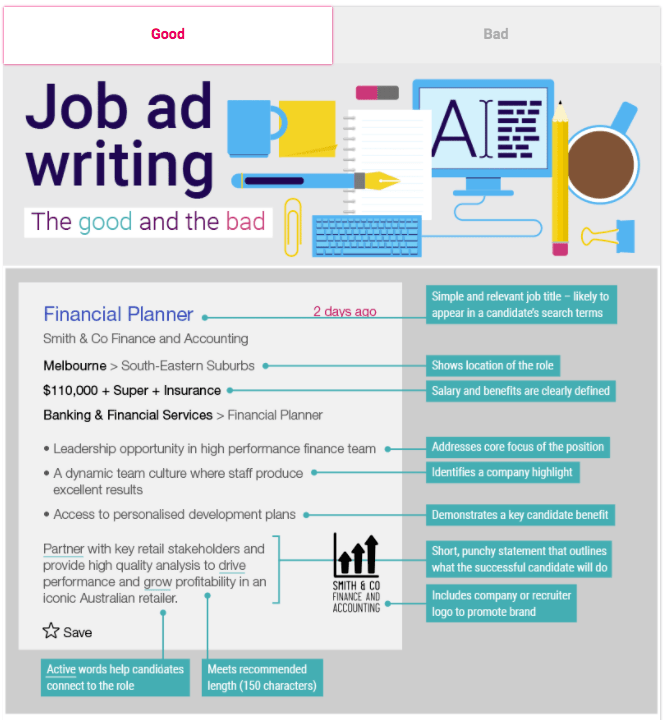 A good job description sets clear expectations for a future employee. Also, it reduces the risk of a misleading and deceptive conduct claim against your business. Now the other part of avoiding a misleading and deceptive conduct claim is to make sure the job duties actually align to the job description. To do this, you may wish to speak to HR as well as people working in a similar role to make sure the description is accurate. Is your company local, national, or international? How the role contribute to the success of the business ? How much experience (if any) do applicants need? Why do people enjoy working at your business ? What is work/life balance like at your business ? 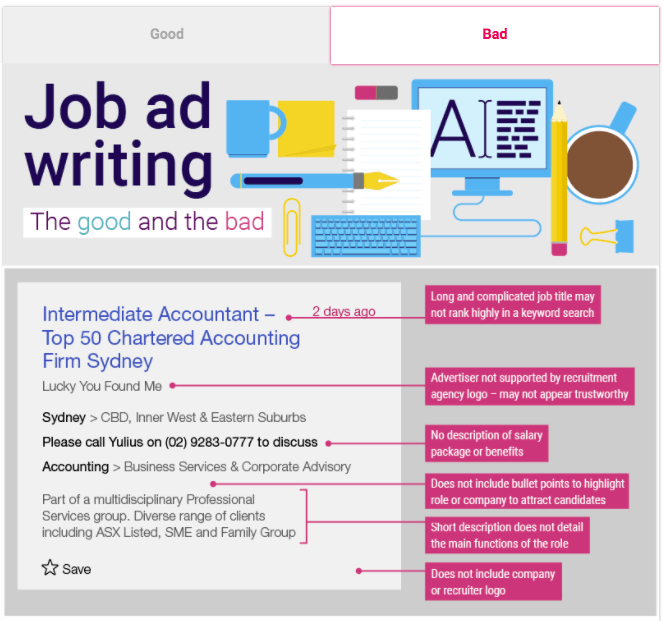 Seek also provides a visual of good and bad job descriptions, reproduced below. employee entitlements including leave, pay and superannuation. A confidentiality clause explains what confidential information is, how it can be used and how it's to be handled when the employment relationship comes to an end. In Australia, an employer owns the intellectual property created by an employee for it's business. For example if an employee creates software or an article for your business then you own the intellectual property in those items. However, it is still important to have a clause that deals with intellectual property in your employment contract. Why ? because in the event of a dispute, you can refer the employee back to their employment contract and reduce the risk of a dispute escalating to formal legal proceedings. Similar to the intellectual property clause above, a dispute resolution clause also helps you save on legal fees. This clause allows either the employer or employee to raise issues and conciliate before a matter gets to court. In Australia, employees have the right to bring a dispute before the Fair Work Ombudsman. Employees may also start unfair dismissal proceedings against you in some instances even if you do not fire them. For example, even if you do not dismiss a worker, but handle a workplace dispute poorly and the employee then feels they have no choice but to resign, they may lodge an unfair dismissal application against you on the basis that they were forced to resign. So this example above shows there is a strong case for a good dispute resolution clause. You will need to provide workers with a copy of the Fair Work information statement before, or as soon as possible after they start working for you. An employee can be paid more than the minimums set out in an applicable award and legislation but be paid less.